This chili didn’t come out nearly as hot as I would’ve liked, but it’s a good mellow chili with a small kick. Enjoy. Substitute a pound of ground beef if you want to make this un-veggie. 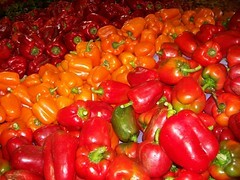 Wash the pound of peppers, and put them into the food processor. (Leave two small hot red peppers out, and put them to the side.) Also put into the food processor: 1 medium onion, 2 cloves of garlic, and a drop of olive oil. You want to grind this all up until you have a paste, but you don’t want to liquefy the peppers. 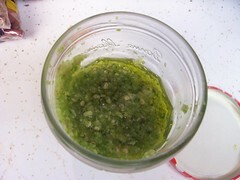 Scoop the pepper mush into a jar you can seal tightly. Get the top into a flat surface, pour just enough olive oil on top to cover the surface (as little as possible). Leave the jar of pepper mush in the fridge overnight. Fill an 8-quart pot about halfway with tomato sauce. Pour the beans into this. Let it bubble for about an hour and a half, with the lid a few millimeters ajar. Add about a third of the pepper mush and stir it all very well. Check it every so often to make sure the bottom doesn’t burn. Cut up one small onion and the two hot peppers you put aside from yesterday. Saute them lightly, then toss them into the tomato sauce and beans. You are stirring every so often, right? Cook up two packages of fake ground beef. Add them to the tomato sauce. If it’s too solid, add a little more tomato sauce. Add another third of the pepper mush. Let this whole thing cook for an hour or two. Cool and put it in the fridge overnight. Put it back on the stove and bring it to a bubble. Spice it up again, like yesterday’s laundry list. Add a little more Merlot and the rest of the pepper mush. Let it bubble for an hour or two, stirring and scraping the bottom every so often. Stop when the beans are soft enough to eat.